Students who register for GED preparation classes must attend an orientation session which gives an overview of the GED program. Students are also required to take a pre-assessment test prior to the start of class. Check here for the current semester schedule. The GED Program prepares students to take the GED examination. The GED Program offers integrated instruction in the four areas covered on the GED test: Reasoning through language arts, Science, Social Studies and Mathematical Reasoning. Students who register for GED preparation classes must attend an orientation session, which gives an overview of the GED program. Students will also be required to take a pre-assessment test prior to class start. Interpreting nonfiction informational text, analyzing nonfiction informational text, interpreting fiction, writing effective sentences, connecting ideas, writing about text, polishing your writing, grammar and writing mechanics. Science Practices; Life Science; Earth and Space Science; Physical Science. Number sense and problem solving; decimals and fractions; ratio, proportion, and percent; data, statistics, and probability; algebra basics, expressions, and polynomials; equations, inequalities, and functions; Geometry. Social studies practices; U.S. History; civics government; economics; and geography the world. A majority of the courses taught at the Technology and Education Program use handouts covering detailed subject matter on the material taught in class. 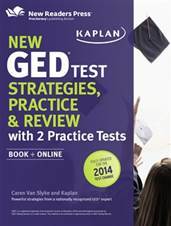 The following course requires a textbook that can be purchased online via GED Marketplace.